Hulu has seen a massive change in the media ecosystem since it was first announced as a joint venture between Fox (s NWS) and NBC Universal. 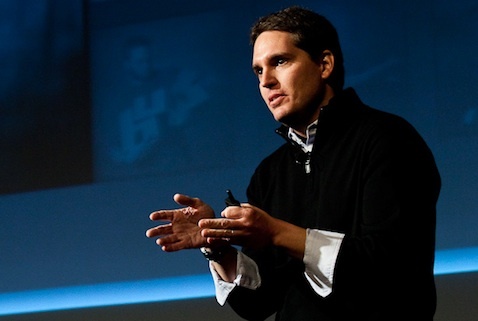 (s CMCSA)(s GE) But while the company was formed primarily as a way for content owners to distribute and monetize content online that would otherwise be pirated, Hulu CEO Jason Kilar said that there’s more reason for Hulu to exist now than there was four-and-a-half years ago. At the D:Dive Into Media conference on Tuesday, Kilar highlighted that the company’s content offering is much bigger today than it’s ever been, with more than 330 content partners, not just the three (Fox, NBC and Disney) (s DIS) that hold an ownership stake. He said there’s more content for users, more users and a lot more usage of the site now than at launch. But while that growth could be seen as a positive for the industry, there’s been some worry that services like Hulu, Netflix (s NFLX) and others could eventually eat into existing business models. In response, Kilar likened the onset of Internet video to the invention of TV. When movie studios first looked at that new invention, there was some fear that TV could be a potential threat to their existing business models. And yet, TV created a huge amount of value for the industry. In the same way, while Internet video is seen as a potentially cannibalizing force to existing models, Kilar theorized that it would grow to become a huge opportunity for Hollywood as time goes on. The important thing is that those media companies should not be blind to consumer behavior and demand as it evolves. “You need to balance that existing business while also planting seeds that can bear fruit as time goes on,” he said. He also had a very positive view of the online video ecosystem beyond just his own business. “There’s going to be many winners in this space in the next 10 to 15 years,” he said. Kilar said that the $420 million in revenue that Hulu announced at the end of 2011 was not a revenue miss. He said the board plan for the year was for $408 million, but in the first half of the year the company was pacing well above that, which led to the forecast that Hulu could near $500 million for the year. But in the third quarter the ad market softened and pricing changed. Hulu expects to spend $500 million on content next year, but won’t need to raise additional capital to pay for it, Kilar confirmed. When discussing the various online, mobile and other connected device rights that Hulu and others need to secure, he said it wouldn’t be surprising for our grandkids to look back and chuckle about how a laptop with keys is seen as different from a mobile phone, which is different than a tablet. I love HULU and heve been using it since the begining. I know as a pre-subscription person I was upset about the change but I have accepted it since there is a great deal of benifts that hve come with the price. Some people I know still “boycott” HULU for this but this is the future. My wife and I don’t even use cable or dish any more, we just signed up for NetFlix and HULU and it saves money for all the same entertainment. I’m with you on that…just cancelled Directv and am using Hulu and Netflix on a Roku.